A few years ago, when I first started diving into the world of holistic health, I did a lot of research into the affect that chemicals and processed ingredients have on our bodies. I stopped eating a lot of processed foods and started loading up on good quality food. Food that was close to it’s natural state. I started shopping at the local Farmer’s Market and I quickly found myself buying more and more organic food. After a few months I suddenly realised that although the food I was eating was natural and chemical-free, I was still putting a lot of highly processed things into my body in other ways. The products I was using on my skin, every single day, were full of questionable and even dangerous ingredients. 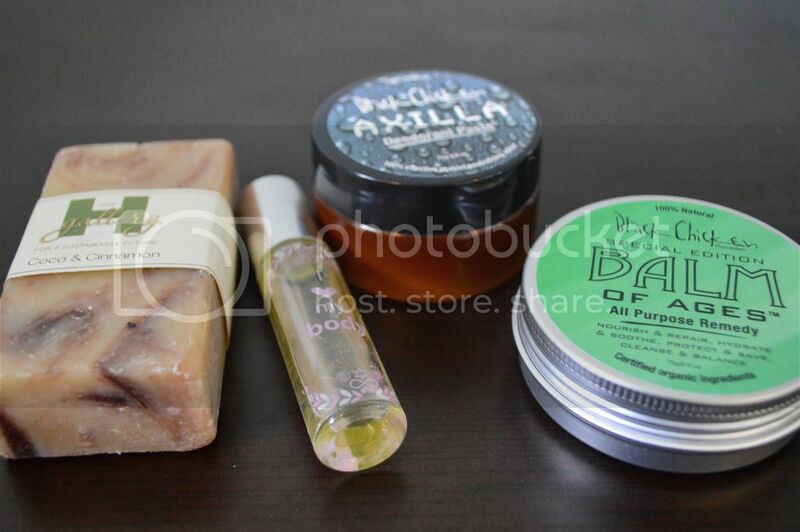 Thankfully, I quickly discovered that there is a huge range of natural and organic beauty products available. And I’ve since stopped buying conventional beauty products. For the last two years I’ve been experimenting with different natural brands and skin care products. After lots of trial and error, I’m finally happy with everything that I’m now using in my skin care routine. Not all of the products that I use are 100% organic. But they are free of nasty ingredients, they aren’t tested on animals, and they suit my skin and my body. So I’m happy. 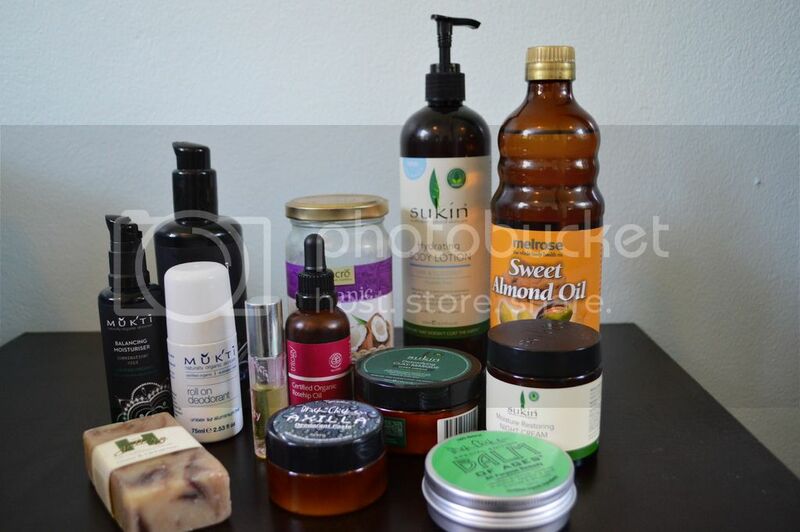 Why should you use natural or organic beauty products? Our skin is our largest organ and it absorbs most of the products we use on it. The exact amount we absorb is not yet known, but it’s usually estimated to be around 50-70%. Women use many, many beauty products every day. Many of us would easily use between 10 to 20 different products each day (and that’s before we even start putting on make-up). Conventional skin care and beauty products have ingredient lists that are miles long, and that are full of synthetic chemicals – many of which have been shown to disrupt our hormones, cause allergic skin reactions, and even be carcinogenic. What are some of the nasty ingredients you want to avoid? Some of the most problematic chemicals are unfortunately also some of the most common in conventional products. These include parabens, phthalates, sodium laureth sulfate and triclosan. You can read more about the chemicals to avoid here and here. 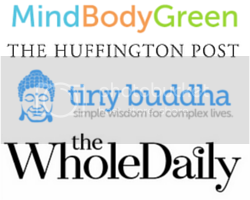 Here’s a round-up of my favourite natural skin care products. A couple of months ago I mentioned that I had fallen in love with oil cleansing. Cleansing my face with a mix of sweet almond, rosehip and grapeseed oil has worked wonders for my skin. It leaves my skin feeling soft and supple, and has also made a noticeable difference in how frequently my skin breaks out. Oil cleansing and the mix of oils used, can be adjusted to suit any and every skin type. If you’re not quite ready to DIY your own cleanser, Mukti have a great range of cleansers. I have used and loved both their Foaming Cleanser and their Hydrating Cleansing Lotion. I have a few different favourite moisturisers. I have skin that can be a little oily in summer and a little dry in winter, so I tend to change what I use with the seasons. Sydney is currently in the middle of an extremely cold winter (well, cold by Australian standards anyway) and I’m loving Sukin’s Moisture Restoring Night Cream. In winter I tend to get a few dry patches, and this moisturiser keeps these patches at bay. It also leaves my skin feeling super soft. I ignore the ‘night’ part of it’s name and use it both in the morning and at night. My favourite moisturiser when the weather is warmer, is Trilogy’s Rosehip Oil. It’s super nourishing moisturiser that I love. It can stain pillows though, so I try to apply it at least 20 minutes before going to bed to avoid this problem. 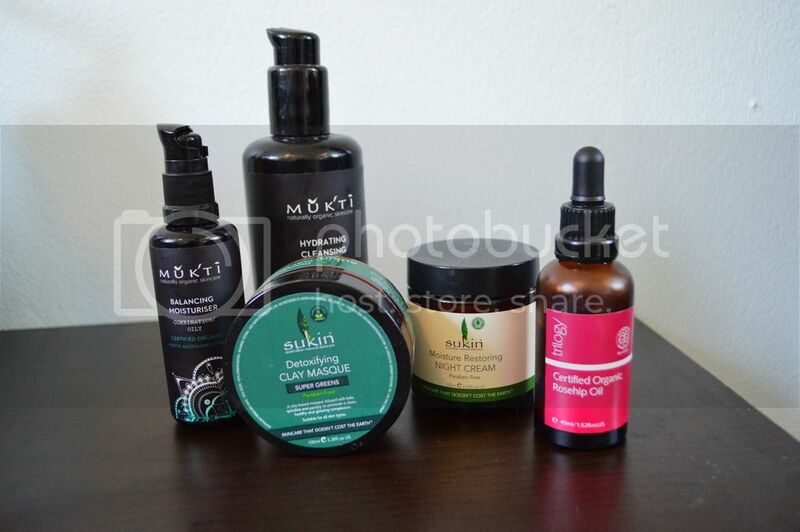 Mukti also have some lovely moisturisers that I have used and enjoyed. Coconut oil is another popular choice. I found it caused me to break out when I used it as a face moisturiser, but definitely give it a try as so many people rave about it. This year I have been working on clearing up my skin. I know that what I eat and how I treat my skin affects how it looks, so I’ve been consciously treating my skin as well as I can. I’ve started using face masks, which I’d never really used before. My favourite mask is the Super Greens Detoxifying Clay Mask by Sukin. My go-to natural shampoo and conditioner are by Mukti. (Are you sensing a trend here?) I have quite long hair so I want a shampoo and conditioner that will stop the ends from drying out and will keep the roots looking oil free. The Mukti products definitely do that. My hair is in better condition than it has been in years, and I have can stretch the time in between washes up to 4 days! If I ever want to put a treatment on the ends of my hair I apply a bit of coconut oil, leave it in for 20 or 30 minutes and then wash it out. It instantly softens and repairs my dry ends. I’m also really intrigued by the No Poo movement, which basically means that you stop washing your hair with any kind of shampoo or conditioner – no matter how natural it may be. Instead, most no poo’ers use things like baking soda and apple cider vinegar to clean their hair. However there is usually an adjustment period that comes with giving up shampoo, and this is what scares me from giving it a try. (For the adjustment period problem, picture greasy hair for up to a month until your hair adjusts back to natural cleaning itself. Scary, right?). I did recently buy this book though, so stay tuned as one day I may be brave enough to take the plunge. I’ve been using and loving Hemp Soap since the start of this year. I buy mine from the Farmer’s Market from The Hemp Gallery who are a local company from the Northern Beaches. My favourite scents are coco and cinnamon, and almond butter and milk. My skin can be very sensitive and I’m prone to shaving rash, so I have to pick my body moisturisers carefully. My everyday go-to is the Hydrating Body Lotion by Sukin. It’s a great year round moisturiser, that helps with dryness in winter and isn’t too heavy in summer. Whenever I get any problem areas, the Balm of Ages by Black Chicken will help clear it up super quickly. And again, coconut oil is a great all over moisturiser. I have been trying to find a natural deodorant that works for ages. I don’t know if I’m just smelly or if a good one is hard to find, but it has been really difficult to find one that will last all day. I’ve just purchased the Axilla Deodorant Paste by Black Chicken. I’ve only had it for a few days, but so far it has been great. This may just be the holy grail of natural deodorant. Mukti also have a good natural deodorant. However on days when I’m working out or getting sweaty I do need to reapply this one. I use a roll-on perfume made from love and essential oils. (Yes, love is actually listed as an ingredient). I can’t get enough of the I Love My Body perfume by Sacred Self. The smell is delightful and light, and the name of the perfume always reminds me to give thanks and love to my body. What are your favourite natural beauty products? Have you ever given No Poo a try? Great article! It’s always nice to stumble across new products to try. I started doing the no-poo thing about a week ago (I put it off for ages!) My hair hasn’t been greasy, just a little less shiny and more prone to tangling. And it’s lasting 3-4 days between washes instead of my usual 2. So, I am sticking with it for now! It’s wayyyy better than I expected, so don’t be too scared haha. awesome post!!! some products here that i have already tried, and some that I will look into…. oh and natural deodorant – cant go past erica brooke – much better than all the others i have tried. Hope you are well and love reading your posts. Hi Amanda, I’m glad to hear that you enjoyed the list. Definitely try Mukti – I like it better than conventional shampoo and conditioners. I hope you’re well too. We’ll have to catch up again soon. Post-workout sweat can definitely be hard to combat and I’ve yet to find a good natural dry shampoo. But maybe when I do I’ll share an updated list – I’m sure I’ll be washing my hair a lot less after the birth of my little one haha.